activities 48 hours ahead based on conditions. 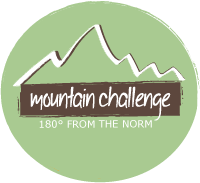 Facebook and follow us on Instagram @mtnchallenge180! Big wall climbers in Yosemite National Park traditionally congregate and stay in the Park’s Camp 4 camping area. Not only is this area ideal for staging climbs; it is also home to great bouldering routes and problems. Camp 4 also provides opportunities for flexibility and strength training. In fact, Yosemite climbers often train at Camp 4 for overall fitness, to improve their skills or during bad weather. To address the overwhelming epidemic of obesity and inactivity in our community, we launched a countermovement called Camp 4 inspired by Yosemite. On Wednesday afternoons from 3-6:30 pm, Mountain Challenge’s backyard is open for recreational exercise. MC students, faculty and staff as well the general public can climb the Alpine Tower, boulder in the climbing cave, participate in a group fitness class, or design an individualized workout using our kettlebells and resistance bands. We’re basically turning ourselves into an outdoor fitness facility—and a pretty sweet one at that. The Alpine Tower, bouldering cave and yoga deck as well as access to resistance bands and kettlebells. Student interns from the college’s exercise science and physical education departments will also be on hand to provide fitness assessments and help design fitness programs. Winter at Camp 4 will be every Wednesday from 3:30pm-5:30pm starting February 13 through March 6! Spring Camp 4 will be every Wednesday from 3:30pm-6:30pm starting March 20 through April 24! Check us out on Local 8 News ! !